Russia and North Korea are seeking new modes of cooperation to boost economic and cultural ties in addition to pushing forward with a cross-border bridge and trading house projects, the head of a Russian parliamentary delegation in Pyongyang said Tuesday. The meetings come amid a boost in bilateral ties in recent weeks, with numerous meetings officially surrounding 70th anniversary celebrations of the signing of agreements on economic and cultural cooperation. These include the Khasan-Tumangang road bridge and the “formation of the Russian-Korean trading house to improve trade relations between our countries,” Melnichenko told TASS. Both the cross-border bridge and the trading house would deal directly with the Primorsky Krai region, but Melnichenko also suggested the North Korea could boost cooperation with the Far Eastern Amur and Kamchatka Krai regions. According to a report posted to the Federation Council’s website, another member of the delegation, representative Alexander Bashkin, was there to initiate cultural and educational exchanges with the Astrakhan region out west closer to Moscow. He announced “a proposal to consider educational institutions of the Astrakhan region as basic for the training of Korean specialists in medical and engineering specialties,” that report said. 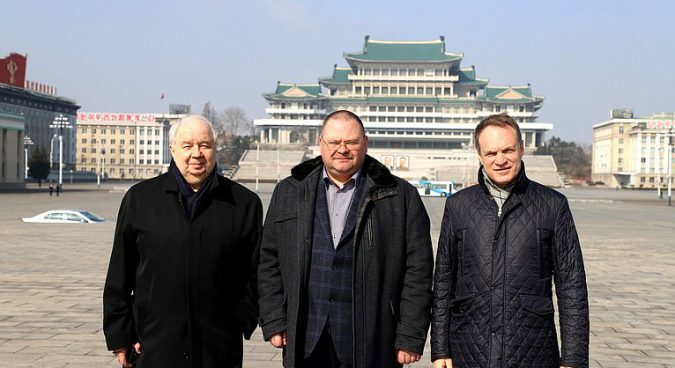 Melnichenko serves in the upper house of the Federal Assembly as chairman of the Federal System, Regional Policy, Local Autonomous and Northern Affairs Committee, but also as chairman of the Russia-DPRK Friendship Parliamentary Group. 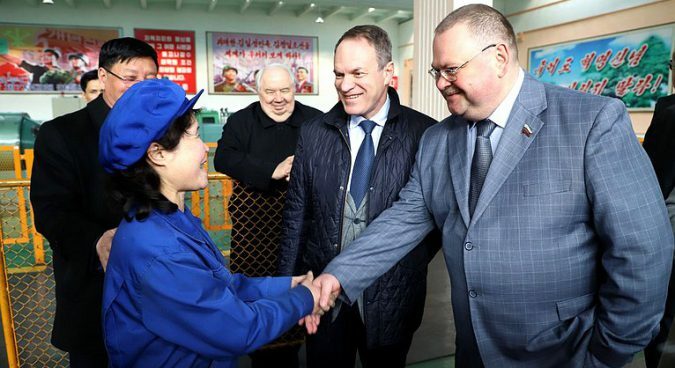 One purpose of the trip, he said, was to form this inter-parliamentary group, first announced with the visit of the Federation Council’s chairperson Valentina Matvienko last September for the DPRK’s foundation day celebrations. 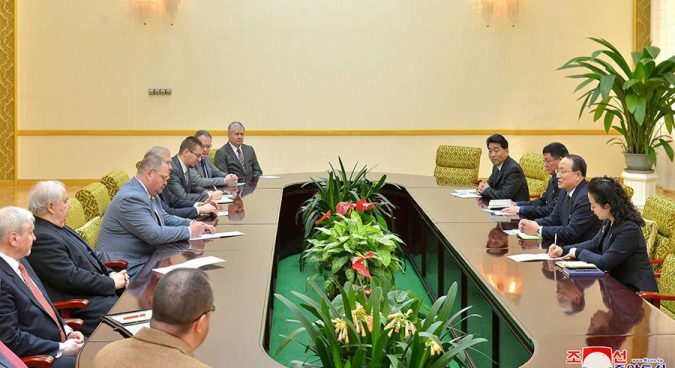 The delegation met in Pyongyang on Monday with the recently-reelected Hong So Hon of the Supreme People’s Assembly (SPA), who serves as Melnichenko’s counterpart as chairman of the DPRK-Russia Friendship Parliamentary Group. Hong is also president of Kim Chaek University of Technology (KCUT), and received DPRK leader Kim Jong Un’s vote in the SPA elections earlier this month. Writing for NK News last month, analyst on Russian foreign policy in East Asia for the Sino-NK research group Anthony Rinna said the two countries have utilized parliamentary- and regional-level connections to maintain close relations. “Provincial governments… have had a key role in both advancing Russia’s ties with the DPRK as well as managing consequences of international sanctions against North Korea,” he wrote. He also pointed out that Melnichenko’s committee in parliament deals with Russia’s natural resources, especially in the regions mentioned during his meetings in Pyongyang, suggesting the two countries continue to at least nurture these contacts in advance of sanctions relief. 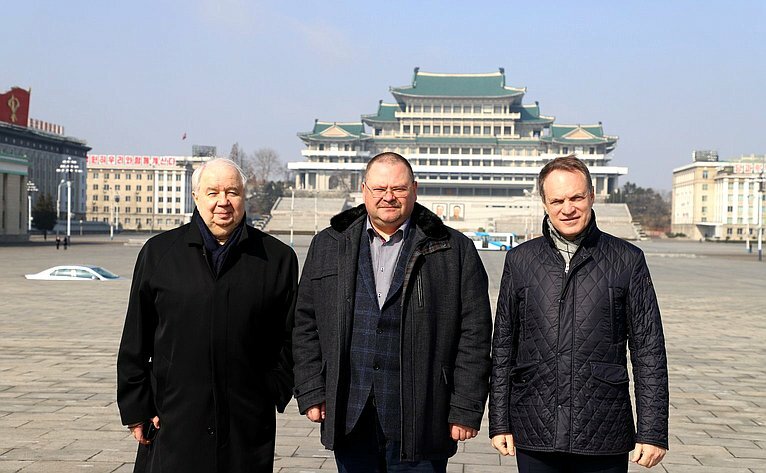 Meanwhile, the delegation also took part in a number of other events in Pyongyang, such as a receptionhosted by Russian ambassador Alexander Matsegora and a film screening at the Taedongmun Cinema. Lawmaker and leader of the Duma’s “Group of Friendship” with North Korea’s parliament Kazbek Taisayev told reporters ahead of meetings on cooperation in trade, economics, science, and technology in Moscow earlier this month that South Korean and Chinese lawmakers had expressed interest in the forum.